LeapTV Reviews - Is it a Scam or Legit? Brought to you by LeapFrog, the LeapTV claims to be an educational, active video gaming system designed especially for young learners that’s easy to play, gets minds and bodies moving, and reinforces learning through movement. In order to accomplish this, LeapTV uses a motion sensor camera in combination with a convertible controller to get kids physically involved in the games they’re playing, and to help them enjoy learning in the process. And with three ways to play, LeapTV is claimed to keep your child entertained for hours, all in an age-appropriate manner. But even though many of LeapFrog’s other products have proven to be big hits with consumers, is this necessarily the case with LeapTV? Let’s jump in and find out. How Does LeapTV Claim to Work? Has your child ever asked you for a video gaming system? If so, you might have immediately imagined all the violence that modern video games contain, or you may have pictured them spending hours staring wide-eyed and slack-jawed at the screen, both of which you’d want to avoid. However, LeapFrog hopes to cash in on this gap in the market with their new LeapTV gaming system, which is claimed to feature more than 100 kid-friendly games and videos, all developed by producers and learning designers, each of which adapt to children and keep them challenged. And similar to the Wii U and Xbox Kinect, the LeapTV features a 640 X 480 resolution motion sensor camera that’s specially designed to respond to kids’ movements, and to keep them active while they’re having fun learning. How Do You Use the LeapTV? The LeapTV’s console is compact, shaped like a circle sitting on its side, and is about the size of a CD player (remember those?). According to the manufacturer’s website, LeapTV features a simple, intuitive interface that makes it easy for kids to navigate. This means that if your child isn’t reading yet, they’ll still be able to follow along using the system’s audio instructions (see more about this in the Consumer Reviews section). You’ll also be able to create up to 5 user profiles for everyone in your family, with a 6th profile available for your child’s friends and other guests. After all, adults will probably want to play too! Classic Control – Similar to a traditional gaming system, although your child will also be able to shake and tilt the ergonomically designed controller during gameplay. The controller’s bulk and V-shaped design are claimed to make it easier for little hands to grip. Pointer Play – Here, after pivoting it into a straight shape (think of it as a “wand”), your child will use the LeapTV’s controller as a pointer to affect what happens in the game. Body Motion – Your child’s movements control what happens onscreen while they watch themselves dance, jump, and on TV. Compared to some of LeapFrog’s handheld devices, which many users have stated leave something to be desired from a graphics perspective, the LeapTV outputs 720p footage, which matches the Wii U. What Kinds of Games Are Available for the LeapTV? If your child enjoys Disney-themed content (and maybe you too), LeapTV’s partnership with the entertainment giant means that many of their games feature Disney characters. These include Bubble Guppies, Sofia the First, Jake and the Neverland Pirates, Pixar characters (e.g. Woody from Toy Story, Little Nemo, Monster’s Inc.), and more. In addition, you’ll also find games with popular Marvel characters, such as Spider Man, as well as games where your child is the main character, such as with their Dance and Learn game. Although the LeapTV only comes with the Pet Play World game (available for free after registering your device), other games are priced at about $30 each, and can be downloaded from the LeapFrog Learning Library. However, if ordered directly through the company, you can also purchase bundled versions that include different games and are priced between $172 and $217. Also, the LeapTV only comes with one controller, but a second can be purchased for about $30. Keep in mind that the LeapTV is also available at Amazon, Walmart, Target, Toys R Us, and many more third-party retailers. What Are Other Consumers Saying About the LeapTV? 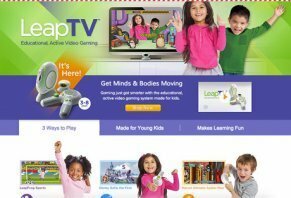 Taking a look at reviews on consumer websites such as Amazon.com, Walmart.com, and several others, it appears that the LeapTV has a very positive online reputation, with some of the most common compliments referencing that kids can be active while they have fun and learn (interactive and entertaining); games are challenging and effectively teach reading, math, and logic (one reviewer even claimed that their child’s first word happened while playing a LeapTV game); and that the system is priced well in respect to value for your money. Calibration can be off at times (see more about this in the final section) and that some games are lower-resolution than others. Game loading can be slow, and some games experience lags in play. It may not keep the attention of younger users. Several reviewers claimed that the ideal beginning age may be around 4 or 5. The LeapTV’s connection to TVs is via HDMI, so if you have an older set with only component leads, you’ll need to purchase an adapter. These aren’t exactly cheap and your only other option would be to buy a new TV, so this may add a good chunk of change to your overall cost. Finally, according to LeapFrog’s UK product expert Nicole Adam, “We want independence for children, so they feel empowered to navigate it on their own, even if they don’t read. And to also free parents from the setup process each and every time a child wants to play a game.” However, unless your child is very proficient with video games, many consumers claimed that you’ll likely need to help them with the navigation. LeapTV has also been featured in popular publications such as Gizmag, VentureBeat, USA Today, CNET, and more. And although it’s not perfect (and what product is? ), nearly every one of these agreed that it’s a great starter gaming console for children, and that it’s sure to be a big hit for Christmas. Is the LeapTV Worthy of Your Christmas List? Overall, the LeapTV addresses a largely underserved market of kids who are too old for baby/toddler video games, but who are too young for full-fledged systems like the Wii U, Playstation, and others. And based on the overwhelmingly positive feedback, with the exception of a few caveats, it seems like they’ve hit a home run. This shouldn’t come as much of a surprise though, given LeapTV’s decades-long history of making quality educational gaming content for children. With that said, let’s talk briefly about the two biggest complaints related to the LeapTV; calibration and usability. Basically, LeapTV’s camera (and other video gaming cameras) operates by measuring how long it takes for light to bounce off the player, effectively working like light-enabled sonar. And because these cameras rely on light to work effectively, there’s a “sweet spot” that you should attempt to maintain when using your LeapTV. In other words, as one Amazon reviewer put it, an important part of dialing in (e.g. calibrating) the camera’s accuracy is proper lighting. As such, if there’s to little or too much light (e.g. a window behind the player), then this will negatively affect how well the LeapTV’s camera tracks the player. Although we weren’t able to verify this information, most video gaming systems also provide calibration options within their menus, which can allow you to further increase its accuracy. For some camera calibration tips directly from LeapFrog, click here. The second most common complaint we encountered when researching the LeapTV was related to navigation. In other words, a lot of kids seemed to have difficulty navigating the system (e.g. game menus and other options), especially the younger they were. Because of this, if you’re hoping to get some chores done while your children learn, you might find that you’ll have to help them frequently, even moreso if this is their first gaming system. This means that if you’ll be giving it to someone next week as a birthday present, they may not have many gaming options to initially choose from. However, it appears that children opening it during the Holidays should have a wide number of choices. Between LeapFrog’s industry reputation, the system’s highly positive online customer reviews, the underserved market it addresses, and its reasonable price (at least from a video gaming perspective), it appears that you can’t go wrong by purchasing a LeapTV for your kids. But if it isn’t, we might recommend purchasing it from a local retailer, which could make the return process quick and simple. But this comes with a big caveat: You might want to shop early, because according to Pocket-Lint, “we feel it could be the undisputed product to top most three to eight-year-olds' lists to Santa.” As a result, you might want to look around for the best deal now in order to avoid the Holiday rush. To stay on top of LeapTV-related events, you can sign up for LeapFrog’s Black Friday and Cyber Monday deals email for advance notice, and you can also search for the Twitter hashtags #LeapTV or #MommyParties. Write a Review for LeapTV!